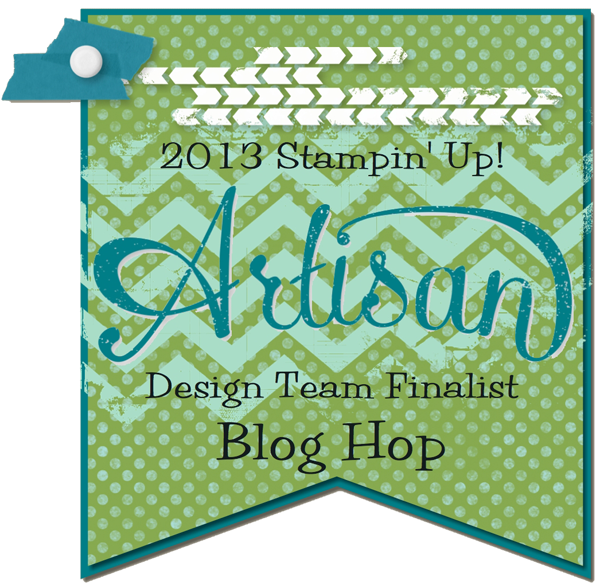 Welcome to Day 2 of the 2013 Artisan Design Team Finalists Blog Hop! You should have come from the fabulous Bree Renwick’s post to get here and from here you can click on “next” and get to Dani Dziama’s amazing work! If you missed Bree either select the “back” button to get there or go all the way around the hop to get back to her. 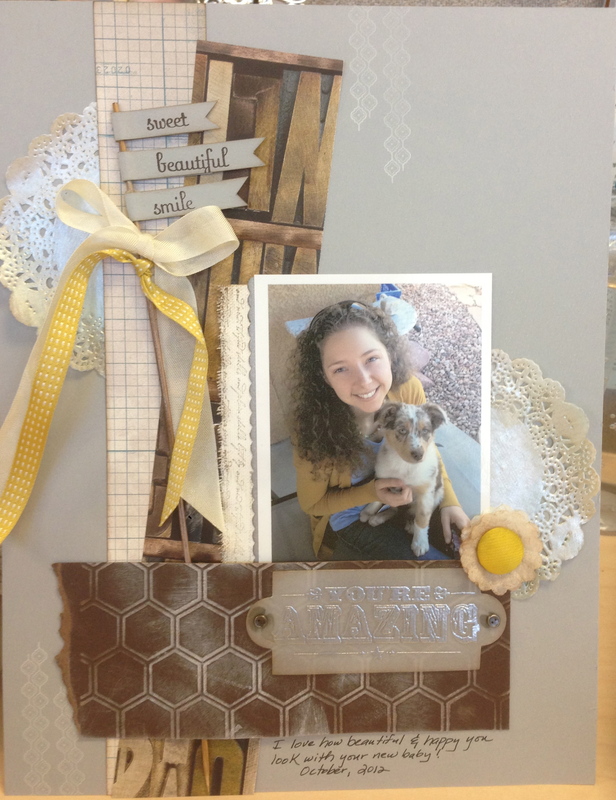 Today I am sharing one of the scrapbook pages I submitted for the Artisan Design Team contest. I love, love, love this page! 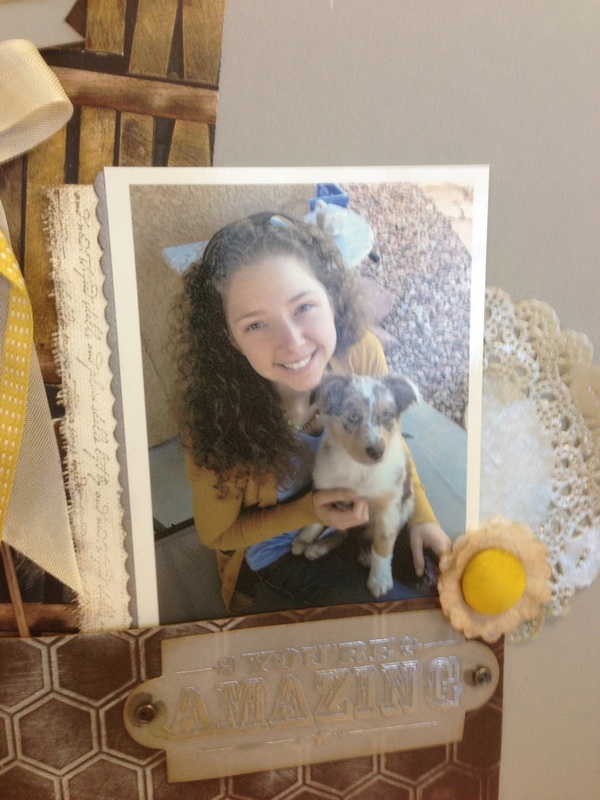 I love the subjects….my daughter and her beautiful puppy Sawyer….and I love the products I used to create it! This is an 8 1/2 x 11 scrapbook page and I used the new member of the neutrals family as my base: Smoky Slate. This color is soooo yummy! I also used a couple of different patterns from Soho Subway Designer Series Paper; it was perfect for this project. Some highlights on the page: I made a “flag” with a wooden skewer and put three flags in Smoky Slate with words from the “Fabulous Phrases” stamp set. I added some ribbon to the flag and slid it under the panel of Early Espresso Core’dinations Cardstock across the bottom. I embossed the Early Espresso panel with the Honeycomb Embossing Folder and distressed it a bit by sanding it and then smearing some Whisper White Craft Ink over the high spots. I included White Tea Paper Doilies again and again, I painted them with shimmer paint. This time I used Frost White Shimmer Paint. Have I mentioned how much I will miss this product???? (sigh) I can’t seem to make any projects these days without using a doily or two! And who would want to? They are beautiful, add just the right final touch to nearly every project and they are sooooo affordable! I embossed “You’re Amazing” from the “You’re Amazing” stamp set in Silver Embossing Powder onto White Vellum Cardstock and then used one of the framelits from the Apothecary Accents Framelits to cut it out. I added the brads from Vintage Trinkets to finish off the piece. I used one of the images from the “Mosaic Madness” stamp set to stamp some subtle highlights on the base cardstock in Whisper White Craft Ink. I love how beautiful this is on the Smoky Slate, the image is delicate and soft at the same time. It makes me swoon a little! Lastly, I made a flower with the corduroy Summer Starfruit button and some punched cardstock. I love that Summer Starfruit button and ribbon pick up the color of my daughter’s sweater! Make sure you check out all the fabulous projects created by the finalists by going through the hop! Select “back” to see Bree Renwick’s fabulous work and select “next” to get to Dani Dziama’s amazing projects! This entry was posted in 2013 Artisan Design Team Finalist, Big Shot, Framelits Dies, Scrapbooking, Stampin' Up, Techniques by kate80132. Bookmark the permalink. SUPER TOTALLY BEAUTIFUL!! Thanks for sharing all the little details … somehow you just can’t see and appreciate all the little “extras” when you’re trying to look at these projects on the Convention boards!! A simply beautiful page! Love everything about it! Beautiful page! I really like the pops of yellow. This is such a fabulous page! Beautiful work. What a great page, Cathy! I am loving your eclectic style! And I am definitely loving the shimmer. This page is BEAUTIFUL! I love all of the colors and all of the details! Gorgeous page! I love your flag! Cathy, this is gorgeous! I love all the details, especially the up close look at them. Love, love, love the shimmery doilies!! Your page makes me smile…dunno if it is just your daughter and Sawyer or most probably it is the whole design….love all of the embellishments and DSP that you put together to create this dream scene….TFS! I love, love, LOVE this page! it is perfect! I agree on the dream scene comment & I love that DSP too!